Inspired by the always changing surfaces and textures of water, this private residence fireplace captures the same interplay of light and shadows that you see in smooth water ripples. This video documents the process from the initial sketches, through 3D modeling in Rhino, to building the finished fireplace using 3D milling, fiberglass molding and plaster. Ilan Dei Studio will be hosting Shop Bot training seminars four times a year starting next month (December 2009). IDS is the only west coast location offering training in shop Bot software and digital fabrication tools, and is proud to be teaming up with one of the leading manufactures of computer milling machines in the world. The Rib Cage Awning is an experimental structure that can be flat packed and assembled easily in multiple size arrangements. It was conceived and executed by using parametric modeling software teamed with digital fabrication methods, then assembled in the back of the IDS shop. ID Studio fabricated these orbs for the window of Oliver Peoples, San Diego store, interior designed by architectural firm Commune Design. 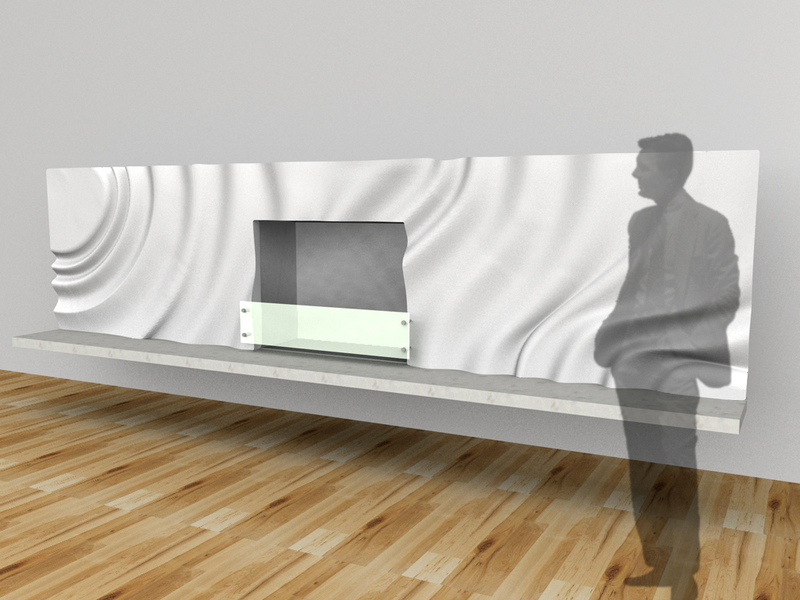 At the Studio, the design was created on Rhino CAD software and then the shape was digitally milled in foam. ID Studio then turned to the Fox Studio Staff Shop, which makes huge props for movies, to make the large vacuum formed molds. Assembly was finished at ID Studio, including sheet metal fabrication and the illumination comprised of RGB LED Light and low-voltage halogen. Ilan Dei’s workshop, he calls it his “lab,” continues to be a center for experimentation in digital fabrication. For the piece below, a bar inspired by a blooming flower, Dei process included digital milling, plaster molding and thermoforming Corian. Dei’s workshop continues to be an internal resource but also one sought out by architects and designers like Scott Johnson, Clive Wilkinson and Griffin Enright Architects who seek Dei’s help in executing their ideas. When art collector Linda Gray approached Dei about designing the interior of her Pacific Palisades home, his task was to make the home a showcase for her collection and also a piece of art in itself. The home’s fireplace is an example of the careful thought and detail that has gone into each area of the home’s design. Produced in Dei’s Venice Beach studio, the fireplace features a ripple pattern that Dei describes as an investigation of movement and light, and which also serves to tie the home’s interior to the cliff-side pool just outside. The fireplace’s fluid ripple pattern evokes images of water and creates a powerful contrast to the fire it frames. The fireplace not only highlights natural elements, it celebrates them with the Green process used in its construction. It is made of plaster, fabricated locally, burns earth-friendly ethanol fuel and is reinforced with hemp fibers.